Florida Keys Fishing aboard No Bones About It! I feel the enthusiasm build every time an angler hooks up to one of our gamefish. Seeing the expression on their face is rewarding enough for me to keep on fishing. 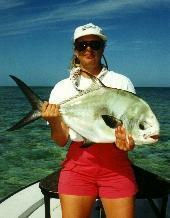 It is the best experience the anglers and I have on a one to one basis for sightcasting on light tackle and fly. Come fish the beautiful waters of our island chain in Islamorada, of the Florida Keys and Everglades National Park. I've organized my site to give you a feel for this beautiful chain of islands we call paradise and to help you organize your trip. Check out the Islamorada Florida Keys Photo Album for a pictorial of some of the great gamefish that we catch here in the waters off Islamorada like Bonefish, Tarpon, Permit, Snook and Redfish. You can visit my Islamorada Florida Keys Fishing Report, but come on back for a lot more information. Your Islamorada fishing trip to the Florida Keys starts at one of two airports available to you and covers everything from there on. Here you'll find what you need to bring and what Captain Ann provides. I have also put together some Special SEASONAL Islamorada Fishing Packages for you. These include 3 or more days of fishing and hotel accommodations. If you don't find what you're looking for here, give me a call and I'll put a special package together for you. If you have a group or organization that wants to put together a fishing expedition, I'll arrange the necessary boats and captains to insure your people have the best available and a good time had by all.
. Put your mind at ease and enjoy your fishing day knowing your children are in the best of care and are learning about our environment here in the Florida Keys! Capt. Ann, and we will ensure your comments are addressed!